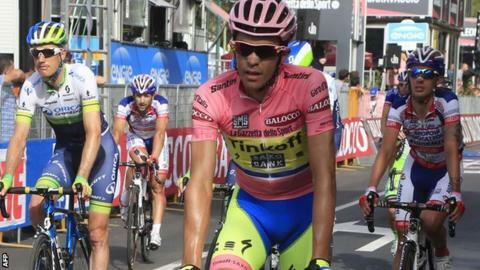 Race leader Alberto Contador suffered a dislocated shoulder in a crash as German Andre Greipel won stage six of the Giro d'Italia. Spaniard Contador, 32, said he was "optimistic" about his chances of continuing in the race, but would "wait until right before the start" of Friday's stage to make a decision. He retained the race lead from Astana's Fabio Aru by two seconds. Lotto's Greipel beat Matteo Pelucchi and Sacha Modolo in a sprint finish. Contador is attempting to become the first man since Marco Pantani in 1998 to win the Giro and the Tour de France in the same year. The crash, which happened in the final 300m of the stage, was caused when a spectator leaned over the barriers to take a photograph and made contact with rider Daniele Colli with his camera. The Italian fell, bringing down several riders in the peloton and severely breaking his arm. Contador appeared at the podium presentation but did not attempt to put on the leader's pink jersey. Friday's seventh stage is the longest of the race, a mainly flat 264km leg from Grosseto to Fiuggi. The Giro ends on 31 May in Milan.